Whether you’ve been working a regular nine-to-five job for years or you want to bring in a stronger income, working online can be a great way to do it. I honestly believe that finding a way to work for yourself can bring so much freedom. It can bring financial freedom, time freedom, and location freedom. There’s no one telling you how many hours in a day you can spend with your family or when you should wake up. And there is literally nothing holding you back from seeing the world. And once we found a way to make money outside of the corporate and retail world, we wanted to share it with others. Finally finding success that seemed so far out of our reach made us want to show others how to do it too. So down below we’re going to tell you how we did it and give you the guiding steps to get started. Now Why Post an Income Report? Income reports were a huge part of our inspiration in learning to blog and get our dream life; living anywhere. They were a place where bloggers opened up about how they made their income and the steps they took to get where they are today. So instead of just keeping their success to themselves, they laid it out for new (and not so new) bloggers. And we wanted to do that too! They showed us how we could make income from ads and affiliates and how to easily sign up for hosting. These bloggers went out of their way to give us great tips on how to get started and what social media sites were needed to get great traffic. So of course, we wanted to show people how to have success blogging as well. And down below, we’ll be giving you the steps and resources you need to get started! In early 2015, my husband Silas and I were broke newlyweds (very broke). We had heard about creating a side hustle (a job apart from your 9 to 5) from many online entrepreneurs. There were TONS of ideas, but nothing really seemed to quite fit (especially since we weren’t tech savvy at all). That is until we listened to the The Side Hustle Show (a podcast) which interviewed Rosemarie Groner from The Busy Budgeter… on blogging. Now we had never wanted to blog. Everyone kept on saying that it would take years to gain any kind of real income. But Rosemarie had gone from just blogging about her passion for fun to blogging full time and making $5k a month. And she had done this in just a year.. but we wanted this sooner. My husband had been working plenty of energy draining and soul sucking jobs (no joke), for a number of years and I was tired of seeing him coming home exhausted emotionally and physically. We both wanted change, and this podcast (which you can listen to here), literally changed our lives. It was packed with so much information on how to get started that without it, we’d probably be in the same place we’d always been: stuck. 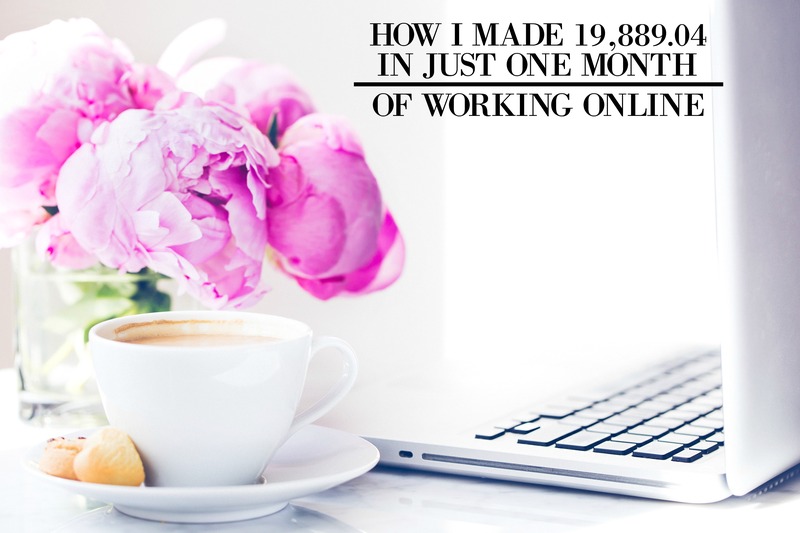 And 3 months after launching the blog… we were making more than my husband’s corporate job. Just from using Rosemarie’s advice and some newfound ideas that we discovered ourselves. So down below, we’ll give you the guidance you need to start a blog yourself and tell you what we did in April to get the numbers we have. Over the last couple months, we’ve been happy to see our blog’s pageviews and income on the rise. With site down-times due to tech problems and other issues earlier on in the year, it’s been good to see things get back to normal. And this month we nearly hit a record for income. We’ve come close to hitting $20k before, and it happened again in August. We’re seriously excited to see ourselves reach new levels in the coming months. Lastly, we finished up on writing our free blogging email course! It’ll be launched fairly soon so feel free to head on over to the pre-signup page here if this is something you’d want to take! Things have still been going strong for us when it comes to our pins on Pinterest showing at the top people’s searches. And the best thing about it is that they’re trending topics on Pinterest! Now if you’re curious about how we were able to do this, I’ll explain. Keywords can have a big effect on your reach through Pinterest. The best way to increase (and how we increased) your chances of ending up at the top (or near the top) of trending pages (on Pinterest) is through using commonly searched keywords in your pin descriptions. I will usually click on the search bar at the top of Pinterest and see what drops down. This will let me know what topics are trending at the moment and what keywords people are using to find that topic. With things running smoothly (no site outages) in May, June, July, or August our numbers are rising steadily. We are back on track for increasing our income to new levels this year. I’m honestly excited to see our business grow in different ways as we roll out our online course and pageviews increase. I just wanted to say that I know it’s so easy to look at other people’s income and wonder how you’ll ever get there. But I need you to know that I started out at $0 with this blog. I didn’t have thousands in the bank when it began, but through hard work and the steps and tips I give you, I was able to start making very good money. And when you put in that hard work, you’re investing into your financial future. You can so do this! Want to start your own blog? I created a free tutorial to show you exactly how to start and set up your blog on a budget (and in minutes!) You can start yours for just $2.95 per month (you can get this lower price through my special link) with Bluehost. Also, if you’re wondering if you actually need hosting or if you could just make money on free blogging sites like Blogger, I’d seriously recommend going with sites like Bluehost. Free blogging sites can delete your blog at any time. It happened to Michelle from Making Sense of Cents when she first started out. It’s also the only way to actually start making income too since you’ll only get accepted with advertisement and affiliate companies if you’re hosted. Now if you’re curious about the different ways I (and other bloggers) make money, I created a list that goes into detail on each category. So if you want to learn more on that, then definitely check out my post on the 5 Ways to Make Income Blogging. Now here’s where I get into the steps of how to start a money making blog. Starting a blog and making money sounds like something only outgoing people and social media experts do. But to be honest, I’ve known so many bloggers who started theirs in the middle of a divorce so they could stay home with their kids, and I’ve know some who started a blog just so they could travel full time. So starting a blog to create income doesn’t have to be a famous person’s thing, it can be your thing. It can be your project. And to be honest… it definitely beats the 9 to 5 job (maybe that’s an understatement). So here are the steps we took for starting a blog and making money fast (or at least faster than a year). Bluehost is what I use, and I wouldn’t recommend them if they weren’t a good company. They’re helpful and will guide you through the process if you have any trouble. Also, they have a special deal for $2.95 a month, which I haven’t heard of anywhere else. It’s really awesome! PPS – There’s a video tutorial in there if you’re a visual learner! I can’t tell you how MUCH this helped us. What I mean when I say “Do the work before,” isn’t the obvious “find a niche,” “create a catchy blog name,” or, “figure out your audience.” Yes those are all important, but you can read that from so many other bloggers out there. What I mean is, once you’ve done all that, start creating content for your blog before it launches. Say.. 25-50 blog posts, so that when it does launch, people have more than just a couple of articles to read on your site. There’s also another reason for this, but I’ll get into that in step 4. Now whether you’ve heard about WordPress (a blog platform used by many) or not, Bluehost let’s you install WordPress. Once you’ve done that, you can choose one of their themes, but just make sure to choose one that’s very visually appealing. It probably goes without saying, but the better looking your blog is, the more viewers are going to see it and come back because you look legitimate. In my post on how I made $500 in May, I give a rundown on what both of those two things are. They’re both free and once you understand them, I suggest signing up for them as quickly as possible. Especially Adsense since it’s probably going to be your top money earner. Now in step 1 I told you that there was another reason for creating content beforehand, and this is why. Adsesne is Google’s ad service. They’ll display ads on your site for people to see. And when those ads are on your blog, you’ll start to gain income from them. However, Adsense can be picky about who they accept, so you’ll want to have some good content on your site before you sign up. That way they can see that you’re legitimate, not just some person who started up a blog, threw a few posts up there, and then never did anything with it again. They want real traffic seeing their ads, otherwise it’s useless. So make sure you have enough content up so Adsense doesn’t turn down your blog. I learned that Pinterest was my secret weapon. Here’s why: sites like Facebook are made for socializing with friends (hence why it’s called social media). However, Pinterest is almost strictly used for finding content. So if you’re in need of a recipe, you go to Pinterest, not Facebook. And this is why Pinterest is great for bloggers (you’ll want to get a free Pinterest Business Account), you can get blog posts seen WAY more easily, unlike Facebook where you now have to pay for your page to be found. Group Boards: If you don’t know about group boards on Pinterest yet, then you should definitely keep on reading. Group boards are where someone invites others to share content on their board. And guess what? If you’re on a group board, the pins from your site get seen by all of their followers. So if the host of the group board has 50,000 followers, a lot of those people are going to see your content. If you want to find group boards in specific niches, head on over to Pingroupie and check them out! The best way to apply for a group board is to find the host of the GB, which is the first person in the list of contributors, and email them through the given email in the description or on the site that’s linked to on their profile description. You’ll then want to send them a very polite message letting them know that you love their content and would love to contribute to their board. LASTLY! Don’t be intimidated by the size of their board, even when you’re first starting out. If I had told myself to stay away from the big boards early on, I wouldn’t have had the reach for my pins that I have today. Pins: I’m not tech savvy, but I make pins EASILY with Picmonkey (a free online photo editor). Now there is a membership program that gives you a ton more options, and it’s only $4.99 a month or $33 a year. That’s like… a few Starbucks drinks, and it’s seriously worth it! Check out this tutorial on how to use Picmonkey to create pins here! Now this may be my last point, but it’s definitely not to be overlooked. WIIFM stands for “What’s In It For Me?” And you have to act like every reader has this written on their forehead. Because if you’re not writing something that helps them in some way, they’ll scan over your pin like it was never there. You have to write and create titles for your pins that solve the readers’ problems NOW. It has to let them know that you’re actually answering something they need help with and it has to be a subject that answers a wide range of people’s problem. You don’t want to put out your personal life stories (at least not until you become known and you have readers who care about you) on Pinterest. So for instance, you don’t want to write about “How to be a Cat Whisperer” (even though that does sound kinda cool), you want to write about “5 Beyond Easy Ways You Can Save $2,000 Per Month.” Again, this is just an example, but you really want to find what other people are posting on Pinterest (in your niche) that’s doing well. For those of you who don’t know what that is, when you create a post and then create a pin image for the post, you create two of them to see which one does better. For me, I do a/b/c/and d testing. I make multiple because you never know which title or which image is going to do better and then make that pin take off like wildfire. I can’t tell you how many times where I thought one pin would do better than the other, but I let them both run for about a week or two and it turned out that the other one did way better. You have to test, otherwise you’ll never know if your post had real potential or not. First, there have been so many times where I’ve heard bloggers complain about how they regret starting out with free services like Mail Chimp. Because when they decide to switch over to a more efficient email list builder like Convertkit (Oh also, you’ll get a free 1-month trial), it take hours for them to transfer their entire list. It’s a complete headache and takes DAYS to do. Now the monthly cost for Convertkit is $29.99 a month which is basically 5-6 Starbucks drinks in a month. I get it, it’s so much easier to sign up for something free when you’re first starting out, but the ease of using Convertkit is so worth it (and you won’t have to deal with moving all your subscribers over later)! ALSO, if you click through my special link for Convertkit, you’ll also get a a FREE 1- month trial! Now this may turn some of you off if you don’t believe in God, but we seriously couldn’t have gotten as many page views without his direction. In so many moments, he helped us realize what we could do better and what we could do differently to get more traffic. We know without a doubt that he’s helped us get the income we needed; he’s beyond blessed us. And that’s why I say prayer has definitely helped us with our blog taking off. If you believe in Him, then I suggest making him apart of the process. Apart from the methods I’ve used in the last few months, those are the only things I’ve done differently to actually make a change and increase my viewership and income. Now this may be overwhelming for those of you who are new to the idea of blogging, but I promise you that if you put the work in, really pay attention to what is and isn’t working, and follow my tips and strategies in this post and others, you’ll be able to work from home too. Putting a lot of work into a blog definitely beats working a nine to five or not making any location independent income at all. Seriously, I had to tell myself this when I was tempted to get a stupid part time minimum wage job (Remember? I don’t have a college degree), and it’s paid off in a huge way. In a year from now, you’ll wish you had started today. That was a bit of advice I had read and took to heart. Even now I wish I had started a year ago. Featured Question of The Month! We’ve decided that for every monthly income report we do, we’ll be featuring a blogging question from you guys. This is the sixth time we’ve done this, and it’s been pretty fun so far! How do you come up with blog post topics? I know that when first starting out, it can be hard to pick topics to write on every week for your blog. In fact, there are many days where you’ll just be completely stumped. However, there are plenty of ways to combat this and I’ll show you how. First, you want to think about W.I.I.F.M. or “What’s In It For Me.” I’ve talked about this in my other posts on blogging but I’ll explain here. When you write in a certain niche(s), you need to act like everyone in this niche has this on their forehead. You need to think about the different problem big or small that people need fixed now. So if you’re a money blogger, some of your readers might need help with not living paycheck to paycheck. Second, if you use Pinterest to promote your posts (and even if you don’t), you can get some great ideas from just looking at what other bloggers are writing in your niche. Becuase if someone wrote on “10 Ways to Make $500 in a Week” (still going with the financial blogger theme), and it did really well, there’s a chance it might do very well for you too. And lastly, go onto other bigger blogger’s sites that write in the same niche as you. Look at the blog posts that are doing well on their site (ones with lots of engagement from readers in the comments and social media shares), and see how you can improve it yourself. What I mean is this; if you choose to write on the same subject that they did, look for where they didn’t add value. If there’s something more that you can add to the topic to make it more helpful, go for it! Email or let us know in the comments down below which one you want answered for next month’s income report! 1. Is it hard to create an online course for my blog? 2. How do I figure out what affiliates are right for me? 3. How Can I Get Started on Networking with Bigger Bloggers? What’s do I do if a group board says it’s closed to new contributors? How do I write (potentially) viral blog posts? Is it hard to travel full-time and run a blog? How do I find the best group boards on Pinterest to join? How do I save up for starting a blog when I hardly have any money? “What if the niche I want to do is already done by so many other bloggers? How will I get people to see my blog and even take an interest in it? What’s the best way to get accepted onto a group board? Lastly, just remember that in a year from now, you’ll wish you started today. This is something Silas always reminded me of when we were first starting out. So where do you want to be in a year from now? Would you rather be surfing Facebook or watching Netflix to unwind after a hard day of work at a dead end job, or would you rather be bringing in a new income stream and working from home? Love this advice! I used it to create my own blog, I’m not moving as fast as you did but the tips definitely are helping a lot! Thank you for being one of my first go-to bloggers for advice on how to start a blog! Are you going to write any more income reports?